Anyone attending Dr.Radcliffe’s School in Steeple Aston between 1928 and 2001 will have been in either Brookes’ or Duckworth’s House. Most people are well aware of C.C. Brookes being the author of The History of Steeple and Middle Aston, indeed you may have bought the SAVA CD and been able to resource it without being one of the fortunate few to own a copy! But maybe you don’t know so much about Richard Duckworth. 19 July 2006 was the 300th anniversary of his death and this caused interest not only across the United Kingdom, but also in the U.S.A, Australia, New Zealand and indeed anywhere where people practise the traditional art of campanology. Richard Duckworth was a keen bell ringer. He is famous to bell ringers across the globe for writing the first book on change ringing. He must have been acquainted with a famous composer of bell ringing methods, Fabian Stedman, whose method “Stedman” is still recognised as the most musically attractive. The history of his life is somewhat sketchy, and as there is another Richard Duckworth of the same period, one has to be cautious. However there was only one Richard Duckworth at Oxford University during the relevant period. Here is a brief chronology of his life from the time he came south to Oxford as a young man. Duckworth must have been deeply interested in bells. While he was at St. Martin’s the bells were recast and hung in a new frame with new fittings. He may well have had the bells at Steeple Aston augmented to a ring of six, but we cannot be certain. In 1668 his book was published: Tintinnalogia, or The Art of Ringing. It is a well written book, giving a clear exposition of the state of the development of the art at the time. It was published by Stedman (initially thought to be its author) and includes a final section giving advice on bell hanging. There are probably two copies in existence. Demand outweighed production and a second edition was published in 1671 with no alterations or additions. The only known copy of this is held in the Bodleian Library. Richard Duckworth was the second Head Master of our school (following Edward Wyrley) at a time when the Rector was also responsible for the school. It is said that he was very severe to his scholars, some of whom were of good birth. It was he who added significantly to the old school building on Northside in 1688. As Rector of Steeple Aston it appears that he had a few problems in his relationship with his parishioners! When he arrived in the parish he apparently hid in the Rectory, even on Sundays. In 1682 the parishioners objected to him being absent from the parish for long periods (perhaps he was off on bell ringing outings!) and ignoring local traditions. It was the custom for the Rector to provide cakes and ale at Christenings and dinner on Christmas day for the people of Steeple Aston and the same again on Boxing Day for the people of Middle Aston. Meanwhile Duckworth complained that the pulpit had been moved to the darkest corner of the church and that the clerk’s seat had been removed causing him to have to lean over in an irreverent posture and that others mimicked this indecent position. He refused to elect a curate and he involved his parishioners in lawsuits. He also made himself unpopular over rebuilding in the Chancel (which seems entirely reasonable as he transferred stone from the North Aisle so that props had to be installed, leaving the congregation exposed to the elements) and tightening up on the payment of tithes and fees. But he did improve the value of the living. Duckworth was not only a benefactor to our church and school, he also improved the streets and water supply to the village. There is a very fine memorial to our famous Rector on the South wall in the church, to the right of the altar. And so back to the school. Although there is no longer a Duckworth’s House (before the days of blue T-shirts the children would collect cornflowers to wear on Sports Day), the Duckworth cup is awarded annually for excellence in an academic subject. Compiled by Diana Gardner (having various reasons for being interested in Richard Duckworth even though her family were in Brookes!). St. Peter and St. Paul Church, Steeple Aston. 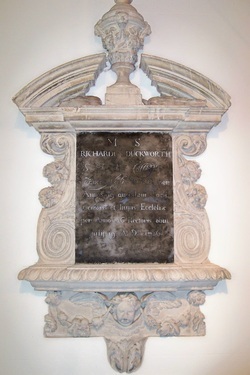 The memorial to Richard Duckworth in the church at Steeple Aston. Steeple Aston school a couple of centuries after Richard Duckworth was Head Master.